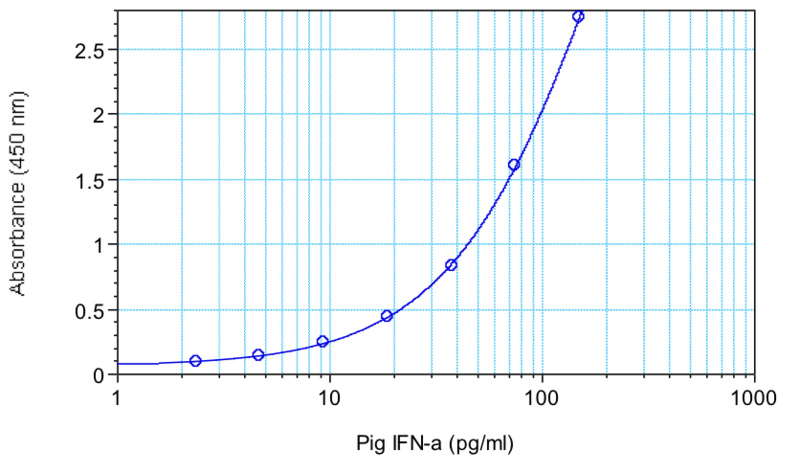 The Verikine-HS Pig IFN-α ELISA kit will enable determination of IFN-α levels in serum, plasma, and tissue culture media. As such, it should prove an important tool in virology, immunomodulation, and immunotoxicology studies conducted in pigs. Interferons (IFNs) are a group of cytokines which exhibit pleiotropic activities that play major roles in both innate and adaptive immunity. Type I IFNs consist of at least one IFN-β gene and protein as well as multiple IFN-α genes and proteins in most vertebrate species. IFN-α expression and secretion is primarily induced by signaling events processed through pattern recognition receptors such as the Toll-like and RIG-I like receptors (TLR and RLR, respectively). While IFN-α can be produced by most cell types, strong evidence suggests that plasmacytoid dendritic cells are a major source of IFN-α in vivo. Following expression and secretion, IFN-α binds to a hetero-dimeric receptor chain consisting of IFNAR1 and IFNAR2 subunits on proximal and distal cell surfaces. Receptor binding promotes a signal transduction cascade consisting of components of the JAK-STAT signaling pathway. Hundreds of genes are regulated subsequent to binding of the IFNAR receptor subunits to IFN-α, thus leading to the antiviral, anti-proliferative, and immunomodulatory activities of the cytokine. The domestic pig (Sus scrofa or Sus domestica) is an important livestock animal. As such, diseases that affect livestock are frequently studied in this animal. Furthermore, it is also a significant model of human infectious disease. One of the hallmarks of viral and other infectious diseases is the production of interferon. A number of studies have already highlighted the importance of the IFN system in pigs. Krause CD, Pestka S. (2005) “Evolution of the Class 2 cytokines and receptors, and discovery of new friends and relatives,” Pharmacol Ther. 106(3):299-346. Fitzgerald-Bocarsly P, et al. (2008) “Plasmacytoid dendritic cells and type I IFN: 50 years of convergent history,” Cytokine Growth Factor Rev. 19(1):3-19. Davies PR. (2012) “One world, one health: the threat of emerging swine diseases. A North American perspective.” Transbound Emerg Dis. 59 Suppl 1:18-26. Meurens F, et al. “The pig: a model for human infectious diseases.” Trends Microbiol. 20(1):50-7. Schook L, et al. (2005) “Swine in biomedical research: creating the building blocks of animal models.” Anim Biotechnol. 16(2):183-90.